Bethabara ( ; בית עברה; bēth‛ăbhārāh; Βηθαβαρά; Bēthabará; "house of the ford, place of crossing") is the name used by some versions of the New Testament for the site where Jesus was baptised by John the Baptist. 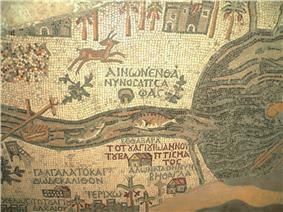 The name Bethabara also appears on the 6th-century Madaba Map and in the Talmud. The most likely location of Bethabara is in modern-day Jordan, called Al-Maghtas. Traditions based on interpretations of the scriptural texts connect the site with two other miracles: the crossing of the River Jordan, whose waters were divinely restrained, by the Israelites under the command of Joshua (Joshua 3); and Prophet Elijah being taken to heaven by chariots of fire (2 Kings 2:9, 11). According to the King James Version (following Textus Receptus of the New Testament), "Bethabara" is the place where John the Baptist baptized those who came to him (John 1:28). However, for the same verse the Revised Version reads "Bethany". It is distinguished in both text versions from the Bethany of Lazarus and his sisters as being "beyond the Jordan". The reading Bethabara became current owing to the advocacy of both Origen (3rd century) and John Chrysostom (4th century), and that same Bethabara is attested in both the 6th-century Madaba Map and in the Jewish Talmud. Various suggestions have been made to explain the readings. G. A. Smith suggests in his "Atlas of the Historical Geography of the Holy Land" (HGHL; 1915) that Bethany (house of the ship) and Bethabara (house of the ford) are names for the same place. Bethabara has also been identified with Beth-barah, which, however, was probably not on the Jordan River but among the streams flowing into it (Judges 7:24). It is interesting to note that the Greek Septuagint Codex Vaticanus (LXXB) reads, Baithabara for Hebrew Masoretic Text Bēth-‛ărābhāh, one of the cities of Benjamin (Joshua 18:22). If this is correct, the site is in Judea. Another solution is sought in the idea of a corruption of the original name into Bethany and Bethabara, the name having the consonants n, b and r after Beth. In Joshua 13:27 (Jericho (see Beth-nimrah), immediately accessible to Jerusalem and all Judea (compare Matthew 3:5; Mark 1:5). This view has much in its favor. Then, again, as ford east of Jericho; but as according to John 1:29, John 1:35, John 1:43 it was only one day's journey from Cana of Galilee, while according to John 10:40; John 11:3, John 11:6, and John 11:17, it was two or three days from Bethany, it must have been well up the river toward Galilee. Conder discovered a well-known ford near Beisan called Abarah, near the mouth of the valley of Jezreel. This is 20 miles from Cana and 60 miles from Bethany, and all the conditions of the place fit in with the history." However, none of the references in John's gospel actually specifies how long it took anyone to get from any of the places mentioned to any of the other places mentioned, leaving it a matter of speculation. ^ Which follows the New York and Moscow uncials, corrected forms of Ephraemi and Athos, along with uncial fragments from St Petersburg, Paris, minuscule 1, and family 13, backed up by Eusebius, Cyril, some Byzantine texts and lectionaries, and the Curetonian Old Syriac, Aramaic Peshitta, Armenian, and Georgian manuscripts, among others cited in The Greek New Testament, 4th ed. (1983). ^ Bruce Metzger, Textual Commentary on the Greek New Testament, 2nd ed. (1994), 171 and n. 5. ^ Raymond Brown, Gospel According to John I-XII, Anchor Bible (1968), 44-45. ^ a b "The Discovery of Elijah’s Hill and John’s Site of the Baptism, East of the Jordan River from the Description of Pilgrims and Travellers | Waheeb | Asian Social Science". Ccsenet.org. 2012-06-29. Retrieved 2015-04-29. 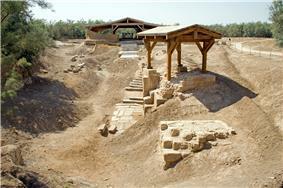 ^ "The Discovery of Bethany Beyond the Jordan River (Wadi Al-Kharrar)". Journals.ju.edu.jo. Retrieved 2015-04-29.